Second Hand Saturday is the NSW north coast’s biggest garage sale day. With over 900 garage sales at last year’s event, 2016 will be bigger and better than ever. It’s a great excuse to de-clutter the house or to raise some money for your local club or charity. Second Hand Saturday is all about joining the fun in your local community. It’s free to register to hold a garage sale. Both individuals and organisations are welcome. Just register online and your garage sale will be promoted for free in local newspapers and online. It’s as simple as that! You can also get involved by shopping at all the garage sales across the region – and from previous years’ experience there will be hundreds to choose from! 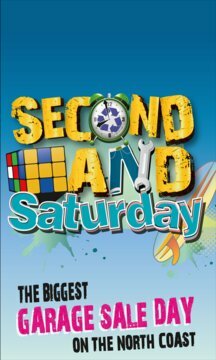 Second Hand Saturday is a FREE community event with over 5,000 garage sales held to date. - Bookmark you favourite garage sales for instant access.